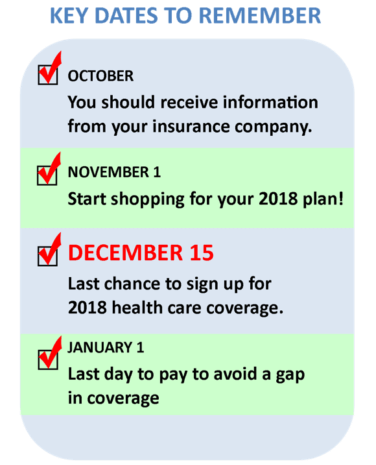 Health Insurance Open Enrollment is coming—11/1/17-12/15/17! 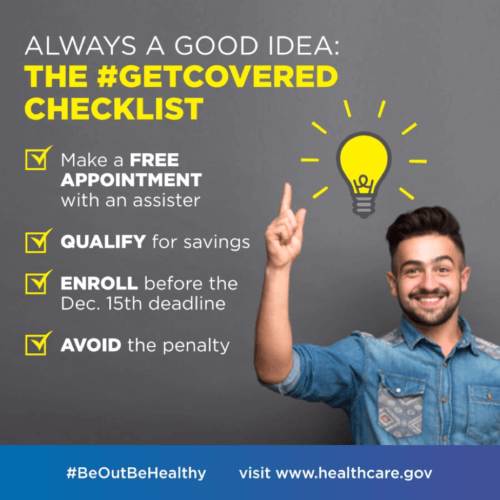 #GETCOVERED for 2018! The Affordable Care Act (ACA) remains the law of the land. Since 2014 – over 22 million people in the United Sates have gained access to affordable, quality health insurance including over 230,000 South Carolinians! Enrolling during this period will provide you and your family with affordable health insurance coverage that will begin on January 1, 2018. What can you do before November 1st to be prepared to enroll? If you are currently covered by a plan purchased through Healthcare.gov, an important thing to do now is a health insurance checkup. To complete a health insurance checkup, you will need to log onto your Blue Cross Blue Shield online account, or call: 855-404-6752 and review all your information. It is very important to make sure your monthly premiums have been applied and are current. In addition double check all your personal information. Once you make sure your documents are up to date and accurate, you’re ready to enroll on November 1st! If you do notice an error, be sure to correct any issues as soon as possible by contacting Blue Cross Blue Shield at 855-404-6752. If you discover you have unpaid premiums – you will need to make sure those are paid before your new coverage starts on Jan 1, 2018 to ensure your coverage will begin. You may also need to provide proof of citizenship or qualified immigration status. Where can you find assistance with enrollment? Remember: This could be your only chance to enroll in ACA health care coverage for 2018. Don’t miss it! Make sure you go through the checklist and #GETCOVERED!